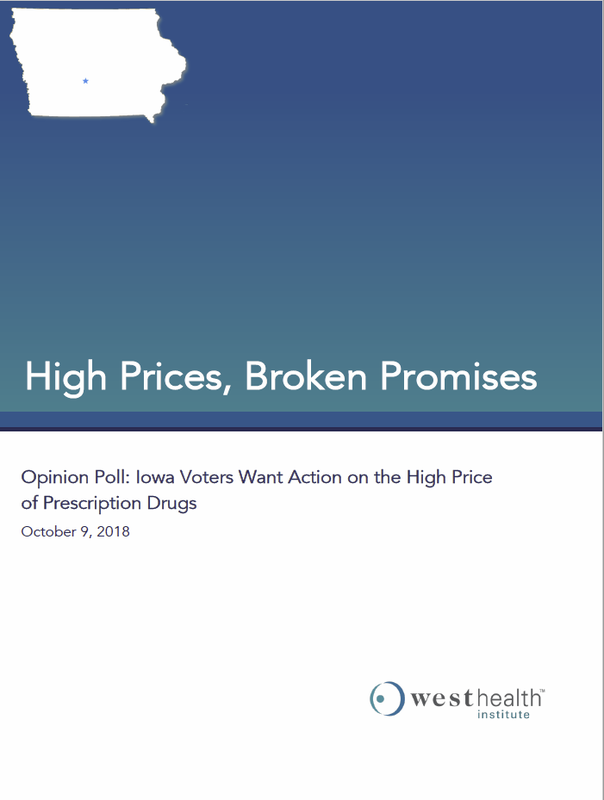 Oct. 09, 2018—Over three-quarters of Iowa voters feel the cost of prescription drugs is “unreasonable” and mostly disapprove of how President Trump and both parties in Congress are handling the issue, according to a new poll released today by the West Health Institute, a nonpartisan, nonprofit healthcare research organization. Voters are mostly disapproving of the way the president and Republicans and Democrats in Congress are handling the high cost of prescription drugs, which is likely to be a key campaign issue in the run up to the midterm elections. The survey found nearly two-thirds (64 percent) of all Iowa voters believe reining in high prescription drug costs should be a top priority for candidates running for Congress. This is a sentiment that a majority of voters believe regardless of party affiliation, the poll found. The survey found the cost of healthcare is the single most important issue facing the country for 60 percent of Iowa voters—even more important than jobs and the economy (44 percent), immigration (28 percent) and national security concerns (26 percent). When asked about possible ways to reduce drug costs in particular, 86 percent support allowing Medicare to negotiate directly with drug companies and 66 percent said they would be more likely to vote for a candidate who supports this approach. Meanwhile, 83 percent said they want President Trump to take steps to clear the way for Medicare to negotiate directly. The president previously supported the idea but did not include it as part of his “Blueprint to Lower Drug Prices” released in May 2018. Under current law, the federal government is explicitly prohibited from negotiating directly with pharmaceutical companies to lower drug prices for Medicare. According to the Centers for Medicare & Medicaid Services, national health spending was $3.3 trillion in 2016, with $328.6 billion going toward prescription drugs. Eighty-five percent of voters also support requiring drug companies to release information to the public on how they set their prices and 39 percent support requiring drug companies to set the price of a drug based on how well it works for patients. This poll reflects a telephone survey (calls were made on landline and mobile phones in both English and Spanish) statewide in Iowa. The poll was conducted by J Wallin Opinion Research for West Health Institute with a margin of error of +/-3.6%. The survey was conducted from August 16 through August 23, 2018.